Kenya Deputy Prime Minister Uhuru Kenyatta, a leading presidential candidate in the 2013 Kenya general elections and his running mate William Ruto have been banned from visiting Europe. 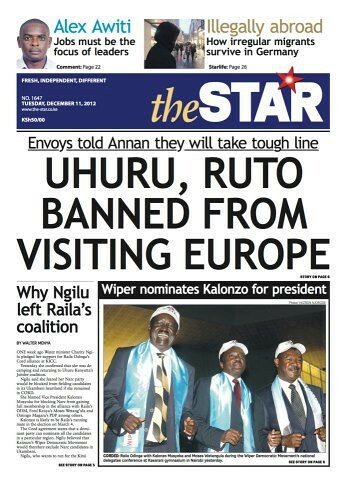 Uhuru and Ruto, who are both facing crimes against humanity charges at the International Criminal Court (ICC), have been banned from traveling to any country in the European Union with the only exception being the city of Hague, Netherlands where the ICC is based. The two were indicted earlier this year along with former Had of Civil Service Francis Muthaura and journalist Joshua arap Sang over involvement in the post-election violence in 2007-2008. They have all declared their innocence and their trials are expected to begin in April 2013. Uhuru's party TNA recently formed an alliance agreement with Ruto's URP and Mudavadi's UDP to run under the Jubilee coalition. 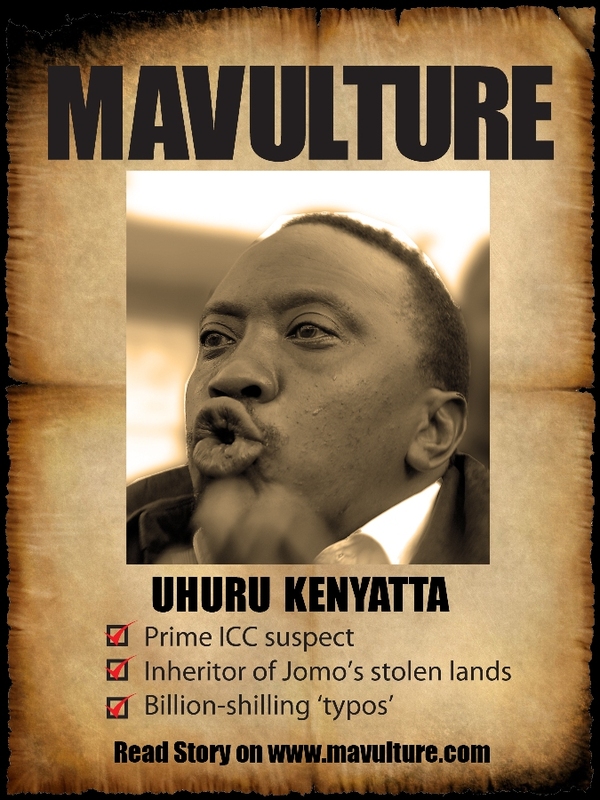 Under the agreement, Uhuru will on December 18 battle it out with Mudavadi for the coalition's flag-bearer position. The winner of the nomination process will contend as the coalition's presidential candidate, with Ruto as the running mate (Mudavadi, Uhuru Head for Tuesday Showdown). hivi ebu mtu anijuze what happened yestarday, niliona watu wamegether kwa pitch pale walikua wanavote kwa nani sikumbuki na ni nani alipata nyingi? Mkuu jamaa hawa wana roho ngumu kuliko ya PAKA, hivi wanafikili DUNIA inaweza kuwa samehe baada ya kuteuliwa kwao kuwa Rais na makamu wake, wasijidanganye mkuu. Wajifunze kutokana na masahibu yaliyo mkuta Laurent Gbagbo na mkewe. Maana mleta uzi ana "personal interest" na CORD!!!!!!!! I have personal interest in widening the democratic space hio biashara unayoleta ni mtazamo wako na nashkuru. Now here is what you call fiction yet its coming right from the Star Newspaper in Kenya...with the link if you so choose. VARIOUS European countries have already issued travel bans against Deputy Prime Minister Uhuru Kenyatta and Eldoret North MP William Ruto because they are facing charges of crimes against humanity at the International Criminal Court. The suspects have not officially been informed of the travel bans but would find out if they applied for visas to travel to Europe. The US government is also reportedly taking a tough line on travel by the suspects. The travel bans were issued separately from February this year, just weeks after the International Criminal Court confirmed charges against Uhuru, Ruto, the former Public Service boss Francis Muthaura and radio presenter Joshua arap Sang. Multiple European diplomats in Nairobi separately told the Star that they are not allowed to associate with the ICC suspects. "We are not allowed to meet or talk to them," said an envoy. Another ambassador said he is forbidden from meeting Uhuru or Ruto "except under exceptional circumstances". Uhuru stepped down as Finance minister in January, partly because donors and diplomats had already indicated that they would not be able to deal with him while he was facing charges in the Hague. Uhuru and Ruto, formerly bitter political rivals, formed the Jubilee Alliance for the March 4, 2013 election. Last week they were joined by Deputy Prime Minister Musalia Mudavadi who allegedly had been promised the Jubilee nomination for president. However Uhuru said over the weekend that only the coalition nomination process next week will determine who the presidential candidate will be. Various forces in the state machinery and the Central Province establishment had become concerned that Kenya might face serious economic sanctions if Uhuru and Ruto were elected president and deputy president. Uhuru and Ruto have denied the ICC charges of involvement in the violence that followed the 2007 poll and left 1,200 people dead and displaced 300,000 from their homes. Uhuru has insisted that he will "follow due process" and if necessary go to the ICC where his trial opens on April 10. However the probable second round of the presidential election will be held on April 11. If Uhuru and Ruto win the election, they may already be in the Hague and unable to govern. If they do not go, they will face arrest warrants and sanctions will probably be imposed on Kenya. The present EU travel ban would therefore appear to be just a preliminary warning shot. Uhuru and Ruto are now limited to traveling to African countries, Gulf states, East Asia and countries outside the European Union. No ICC suspect has so far travelled to the West since the charges were confirmed. Last week former United Nations Secretary General Kofi Annan visited Kenya and warned that there will be political and economic consequences for Kenya if an ICC suspect is elected president. Annan said privately that Kenya risked being "disconnected from the international financial system". Western diplomats, in particular America, told Annan that they would take a very tough line if the Kenyan suspects did not cooperate with the ICC. But Uhuru has repeatedly told foreigners including Annan to stop meddling in Kenyan affairs and the upcoming elections. "My focus is on Kenya, the region and the continent. No Kenyan or African has said that Uhuru should not vie for the presidency so the rest if they don't want to associate with us they can stay away," Uhuru told a TNA aspirants meeting at Kasarani two weeks ago. "It is in bad taste for a person like Annan to travel all the way from Ghana to dictate to voters on who to elect in the coming General Election. I am telling him to keep off from interfering with Kenyan politics," said Ruto yesterday. Yesterday EU diplomats said several countries were starting to consider possible sanctions starting with a gradual withdrawal of aid. Another ambassador indicated that possible sanctions would initially be limited to individuals and could include a freeze on overseas assets. But sanctions would steadily increase in the following years if those charged with crimes against humanity did not cooperate with the ICC. "Trade embargos are being considered," said a diplomat. Agricultural commodities such as cut flowers, fruits, vegetables, tea, coffee and fish account for over 90% of Kenya's exports to the EU. The EU is Kenya's second largest market after COMESA and were estimated at Sh89 billion in 2008. The EU is Kenya's main source of imports, mainly industrial (finished) products such as motor vehicles and parts, aircraft and associated equipment, medicaments, iron and steel products, data processing instruments, rubber tyres and other articles of rubber and plastic, medical and veterinary instruments and motor machinery among others. I will request @ mods to reconsider the option of poeple posting article's from Tabloids/gutter press. THE article does not name the envoys from EU that made the proclamations. Most articles writen in tabloids are motivated to make the newspaper sell like hotcakes. Under the new constitution, media bill needs to be debated to regulate those who spin continuous falshoods and enforce professionalism. Haya mambo hayo tena!!! Na mafisadi mbona hawapati ban ya kwenda huko nchi za nje walikoficha mihela!!! Siasa bwana!! Naona wazungu wameamua kukomaa nao ngoja tusubiri. Is the final verdict of their case pending before the icj reached?how about the doctrine of presumption of innocence? From left, the late Tom Mboya, Uhuru Muigai as a boy, Mzee Kenyatta and Dr Njoroge Mungai during a public occasion.